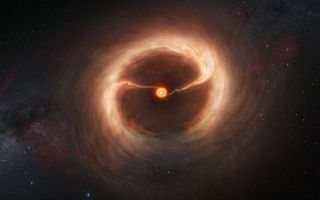 This space wallpaper shows an artist’s impression of the disc of gas and cosmic dust around the young star HD 142527. This space wallpaper shows an artist’s impression of the disc of gas and cosmic dust around the young star HD 142527. Astronomers using the Atacama Large Millimeter/submillimeter Array (ALMA) telescope have seen vast streams of gas flowing across the gap in the disc. These are the first direct observations of these streams, which are expected to be created by giant planets guzzling gas as they grow, and which are a key stage in the birth of giant planets.